Has Man-made global warming been disproved? A Review of Recent Papers. The dominant argument for global warming contradicts Feynman’s “principle of science”. This dominant argument is that a majority of scientists, a consensus, support it4. But as Feynman notes consensus is a false proof of a scientific theory because only one contradictory bit of empirical evidence is sufficient to refute that theory. In fact not one but seven recent peer-reviewed papers have revealed what would seem to be fatal flaws in global warming. Global warming says there has been an increase in the global average temperature since the mid-20th century and its projected continuation. According to the Intergovernmental Panel on Climate Change [IPCC] “most of the observed increase in globally averaged temperatures since the mid-20th century is very likely due to the observed increase in anthropogenic greenhouse gas concentrations.” [AR4, Working Group 1, page 10]. For purposes of this essay then global warming is the increase in global average temperature primarily caused by human emissions of greenhouse gases, primarily carbon dioxide [CO2]. The seven papers discussed use different methods to critique global warming but are all based on empirical data and are in rough agreement that any increase in global average temperature due to a doubling of CO2 is more likely to be about half a degree than the 3.26 degrees determined by the IPCC [AR4, Box 10.2]. The extent of the change in global average temperature to a doubling in CO2 is known as the climate sensitivity [see Figure 8]. The following papers clarify this uncertainty between forcings and feedbacks and show that the global warming science is not clear about the distinction or effects. The papers show the IPCC assumptions about the role of CO2 and water vapor, particularly in the form of clouds, are incorrect and that the IPCC conclusions about climate sensitivity are both exaggerated and wrong. In doing so, these papers also vindicate Feynman’s maxim. From Wielicki, B.A., T. Wong, et al, 2002: Evidence for large decadal variability in the tropical mean radiative energy budget. Science, 295, 841-844. 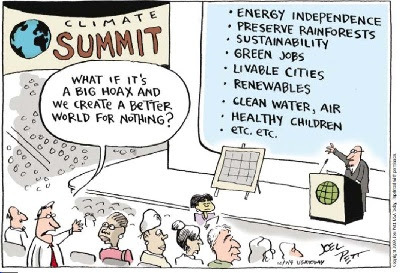 If global warming is going to happen it will be due to feedbacks. If the feedbacks are positive it means that as the world warms, atmospheric conditions would have to change to keep even more of the sun’s energy inside our system. But Richard Lindzen and Yong-Sang Choi show that as the world warms Earth’s dynamic system changes to let more of the infra red or long-wave energy out to space [LW from Figure 1]. It’s like a safety release valve. This means that the system has negative feedbacks (like almost all known natural systems). The changes dampen the effects of extra CO2. If there is no net amplifying positive feedback there is no catastrophe. Because Lindzen & Choi are looking at long-wave radiation leaving the planet [outgoing long-wave radiation], this is a way of assessing all forms of feedbacks at once. We can’t tell which part of the system is responsible: clouds, humidity, ice-cover or vegetation, but we know the net effect of all of them together is that when the world warms, more energy escapes from the planet. Their research was first posted in 20097 and updated in 20108 as a response to earlier criticisms. 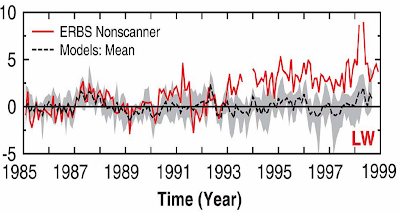 In the 2009 paper Lindzen & Choi measured changes in the outgoing long-wave radiation leaving from the top of the atmosphere during periods that the world warmed. Their findings were a direct contradiction to global warming because they showed that increased CO2 did not block outgoing long-wave radiation. With no blockage the level of available energy in the climate system also did not increase. With no increase of available energy there was no energy to cause positive feedbacks and increase temperature. Kevin Trenberth, a leading climate modeler, criticized the first paper. Those criticisms concerned the extent of satellite data used by Lindzen & Choi, their concentration on the tropics and various statistical methodologies. All of these complaints were addressed by the subsequent paper. They still found that outgoing long-wave radiation increased as the world warmed, which was different to what all the models predicted. That is, clouds moderate or dampen temperature movement in either direction. Spencer & Braswell’s papers in 200810 and 201011 took a different approach to Lindzen & Choi. Spencer & Braswell looked more closely at the nature of feedbacks and forcings and the difficulty of putting a value on feedbacks. The IPCC models assume that clouds change in response to temperature, so they are a “feedback” [AR4, WG1, 8.6.3.2]. 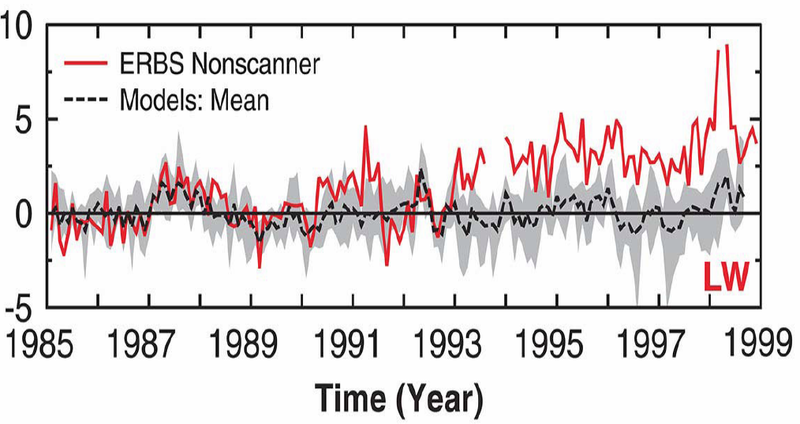 But as Spencer & Braswell show in their 2008 and 2010 papers clouds can be a forcing factor as well. This means that if something other than temperature affects cloud cover (like changes in ocean currents or air circulation) the change in clouds would then force the temperature to change. The latest IPCC report acknowledges that the models don’t simulate clouds well and that’s where the main uncertainties lie. If clouds are not just a forcing in their own right, and provide negative feedback [by shading the earth] that would seriously undermine the premise of global warming. This point is illustrated by two other recent papers. The first is a report by The Climate Process Team on Low Latitude Cloud Feedbacks on Climate Sensitivity [CPT] 12. CPT found “strongly negative net cloud feedback” in a warming world. Utilizing the climate models from NCAR, GFDL and NASA, CPT found this negative feedback concentrated in the Tropics. Similarly Allan 201113 based his study on cloud “radiative effect” in the Tropics and concluded a “net cooling of the climate system” from clouds because solar blocking, cooling, was greater than long-wave blocking, warming. However unlike CPT, Allan did not regard this cooling as a feedback since the cloud cooling was not a response to temperature. Spencer & Braswell provide proof that it’s very difficult to find definitive feedback signals in a dynamic system that is never at equilibrium. The only feedback they can calculate in their 2008 and 2010 papers is negative and means a climate sensitivity of about 0.6 °C for a doubling of CO2, though it’s only applicable over short time-frames. They show the near impossibility of establishing climate sensitivity over long time frames. But if climate sensitivity to CO2 is as low as they find, and dwarfed by potential cloud forcing, it would mean no postponed effect from CO2. We have had all the effect there is and there will be no stored heat lying dormant to cause future climate change. This would explain Trenberth’s concern, expressed in the CRU e-mails that the pro-global warming scientists “can’t account for the lack of warming at the moment and it is a travesty that we can’t”. Spencer & Braswell’s 201114 paper confirms the difficulty in distinguishing cloud feedback and forcing. They also find the global warming models have substantially overestimated the climate sensitivity due to their lack of understanding of this distinction. 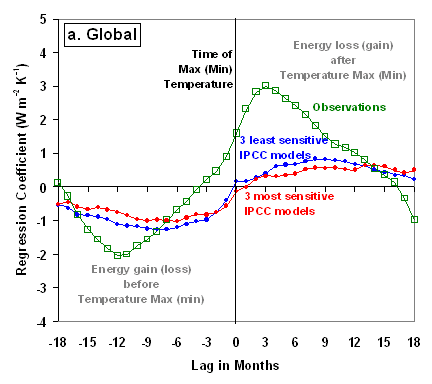 One of the reasons that the models have failed to distinguish the effect of clouds on temperature is the difference in time it takes for the radiative effects of temperature and clouds to occur in the system; temperature effects are immediate while those of clouds take some months as Figure 2 [Figure 3 from Spencer & Braswell 2011] shows. Spencer & Braswell 2011 has received considerable vitriol from the global warming science. This is unwarranted because this science concedes it has a lack of understanding of clouds. Spencer & Braswell have offered an explanation of clouds strongly correlated with and consistent with observations. The criticism of them would seem, therefore, to be based on preserving the global warming theory rather than answering Trenberth’s concern. 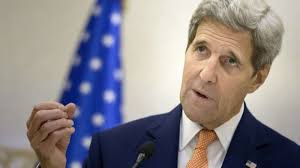 Quote "A forcing is a factor external to or introduced to the climate system which affects, for a period, the radiative balance at the Tropopause, the boundary between the Troposphere and the Stratosphere." I think a forcing is a device used by programmers of GCMs to incorporate factors in models by first estimating the instantaneous impact they would have on the radiation balance, and then putting that effect into the models as an input (e.g. doing it in annual jumps might use tables such as this one http://data.giss.nasa.gov/modelforce/RadF.txt) . Now of course, that instantaneous effect does not happen in the real system. 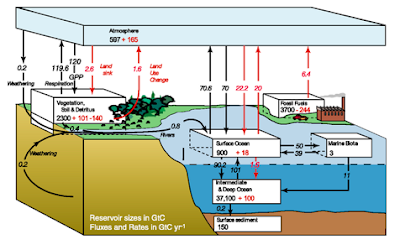 For example, most CO2 releases occur on or near the earth's surface in variable(space and time) amounts, and are duly mixed in to the troposphere over days and weeks as a contribution to ambient levels as measured, say, at Mauna Loa. Whether the 'forcing' method of incorporating this into computer models is a reasonable or sensible one seems to me a moot point. But in the meantime, I would suggest modifying your sentence to replace 'the climate system' with 'conmputer models of the climate system'. I have gotten in an argument with someone and they sent me this link to show me why global warming isn't happening, mind if i use your argument?